With all this wonderful warm weather you shouldn’t be shocked to notice that there’s a tropical aspect to Oak Ride Farm recently. 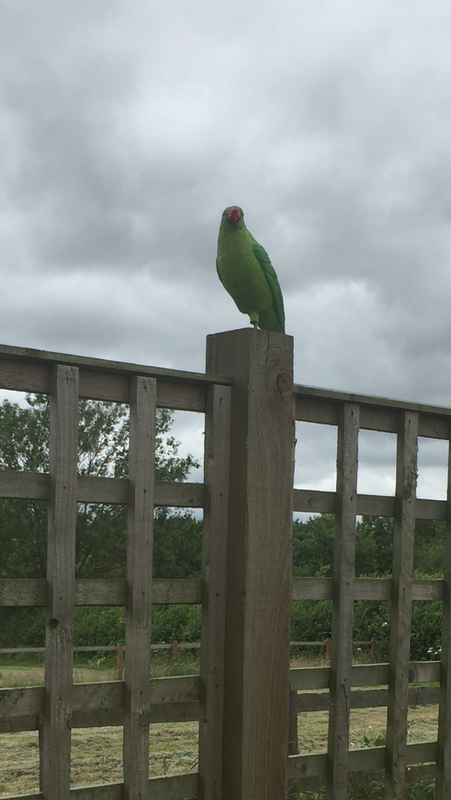 Has anyone spotted the parrot in the drive? Took me several days to notice him, and when I did, I very quietly approached, hoping not to scare him away …… I really wasn’t the only one to be taken in, honestly! Look out for him next time you visit – who knows where he will be? Do you follow us on Instagram oak_ride_farm? There have been some super pictures of our happy guests this week. On 17 June there was a rather unusual breed of dog that was staying with us. Did anyone guess what this breed was? If you are looking forward to your holiday just check that you have booked boarding for the dog and cat. If not, please do it soon, as we are getting very busy. It’s going to be a warm week, so please remember not to leave your dog in the car and walk them at the start or end of the day when its cooler. Especially no road walks on hot tarmac. Don’t forget that we have water treadmill hydrotherapy at Oak Ride Farm, which is a not just for rehabilitation. Fitness sessions are also available. Enquiry’s on 01483 210200 or Mail to hydro@oakridefarm.co.uk and we would be happy to answer any questions.